ShawSpan™ units are high quality, low maintenance precast structures which can be used in a variety of applications including bridges for larger brooks and streams. Each ShawSpan™ unit is a precast concrete rigid-portal frame, with the horizontal top member of the frame functioning as a deck supporting soil cover, roadway and traffic loads across the clear span, and the vertical legs retaining the side fill soils to provide the desired opening height or rise for the structure. Typically, each leg is founded on a concrete strip footing which may be precast or cast-in-place. The standard ShawSpanTM unit width is 1.2m, therefore a 12m road width would be accommodated by placing 10 units side by side. Shaw Precast Solutions produces ShawSpan™ units in a broad range of sizes from 4.27m to 15.33m clear spans (in 610mm increments), and clear rise from 1.22m to 3.05m (in 610mm increments). 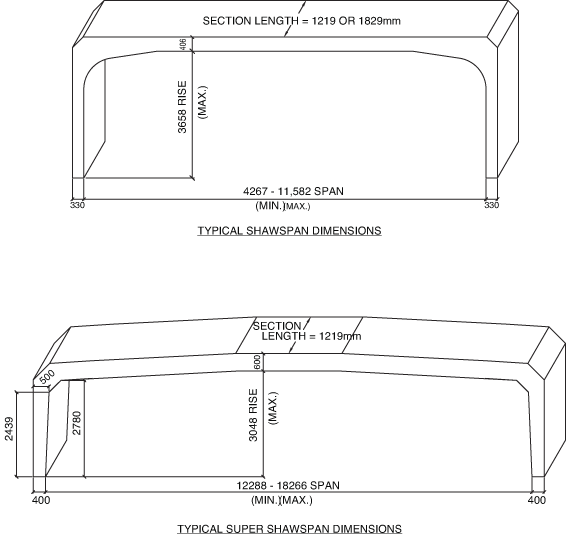 The maximum allowable span for a ShawSpan™ unit is primarily a function of soil cover (depth of soil over the deck) and the specified live load. Based on transportation restrictions, the maximum inside clear height is approximately 3.0m. Additional opening height can be provided by setting the ShawSpan units on a pony wall/footing assembly.